When you are looking for a steel fabricator in Illinois, you want someone who understands commercial construction. TITAN Industries, Inc. has a team of experienced steel fabricators who routinely work with large corporations, organizations, and businesses. We understand deadlines, budgets, and the importance for you to receive a quality product that is perfectly to spec. We have several commercial stair options available for your next commercial construction project. At TITAN, we are dedicated to providing the highest level of service to each and every customer. If you would like to talk with one of our professionals, call TITAN Industries, Inc. at (309) 440-1010 today! Steel continues to be the go-to material of choice for commercial builders, and it is no surprise why. Steel is strong, durable, long-lasting, and affordable. Our steel stairs provide a level of unmatched security and stability. Your employees rely on steel stairs to allow them access to complete their jobs and to keep them out of harm’s way. 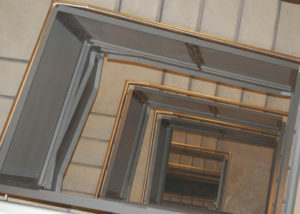 We have several commercial steel stairs, as well as custom options available to ensure your needs are adequately met. If you are in need of commercial steel stairs, contact our office today. When keeping things lightweight is a priority, you will want to talk to our experts about commercial aluminum stairs. Our corrosive-resistant aluminum stairs offer unparalleled quality. Many clients who require metal stairs near waterfront areas have been absolutely thrilled with the quality of our products. While other metals will quickly deteriorate, our commercial aluminum stairs are still standing. We stand behind our fabrication process and are happy to discuss any custom options you may need. If you have questions about the commercial stairs we offer at TITAN Industries, Inc., Contact or call (309) 440-1010 for pricing of our steel and aluminum stair options.